While the Frankfurt-based Bookwire’s Spanish and Latin American operations expand with a new partnership, ProQuest finds US librarians asking for help with non-English content. Germany-based Bookwire—through its subsidiary Bookwire Spain and Latin America—now is responsible for global distribution of the Spanish and Portuguese ebook catalogue of HarperCollins Ibérica. In addition to distribution, the partnership also includes support for ebook marketing activities as well as pricing and reader analytics. The distribution agreement covers Spanish- and Portuguese-language titles from the catalogues of imprints brought together under the umbrella brand HarperCollins Ibérica. Prior to the HarperCollins agreement, Bookwire had added the German-language catalogues of Random House, Bonnier and Holtzbrinck Verlagsgruppe. As Publishing Perspectives reported in October, the ebook distributor, which is based in Frankfurt, has been developing its Latin American expansion, acquiring Brazil’s Distribuidora de Livros Digitais, DLD. In a prepared statement, Jens Klingelhöfer, CEO of Bookwire GmbH, is quoted, saying, “Signing the contract with HarperCollins Ibérica shows that internationalisation is absolutely the right way to go in our business segment. And Javier Celaya, who serves as managing director for Bookwire Spain & Latin America, is quoted, pointing out that “HarperCollins Ibérica trusts our distribution and marketing expertise, and wants to use it to further boost the success of its eBook catalogue. In order to handle that requirement, Bookwire Spain and Latin America has teams and partners now in Spain, Colombia, Chile, Peru and Mexico. Information about Bookwire in Spanish is here. In newly released results of a survey, the Michigan-based ProQuest–parent company of Bowker—reports that academic libraries are struggling to meet a rising demand for non-English language content. 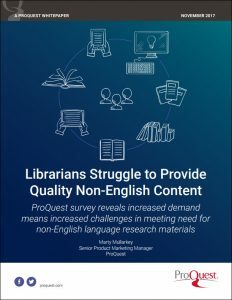 In a prepared statement, ProQuest Books senior vice president and general manager Kevin Sayer is quoted, saying, “This research confirms the need for solutions that enable libraries to more effectively source comprehensive non-English language content, particularly in Chinese, Arabic and Spanish languages. 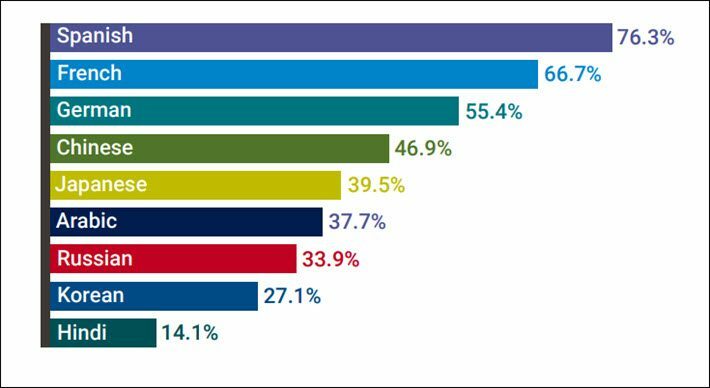 ProQuest surveyed more than 177 academic librarians in North America to assess trends in non-English language collection development. The outcome is available in a free white paper that can be downloaded (email address and name required) here. ProQuest’s services include the provision of content and research services to libraries. Its interest in creating the survey and white paper is based in a part of its core business, which includes a collection reportedly comprising 90,000 sources including scholarly journals, books, newspapers, and more.